How are Credit Cards Different to Store Cards? Home > Credit & Store Cards > How are Credit Cards Different to Store Cards? If most people opened up their wallets they’d probably have one or two credit cards and perhaps a couple of store cards. Both offer you the chance to buy on credit and pay later, both charge interest on purchases and both can get you into trouble if you’re not careful but what makes them different? Store cards are provided by stores and give you the chance to buy products on credit and pay for them later. Each month you receive a bill telling you how much you owe, what you have bought and how much you need to pay back that month. You can of course pay back the whole lot – this is the safest option as if you do this you will not be charged any interest. But there is also the option of paying just the minimum payment each month but if you do this for too long the interest rates add up. Many store cards have higher interest rates than credit cards so be careful about what you spend. Credit cards are similar to store cards. You can buy products on credit and pay for them later. You can either pay for the item in full or just pay a little back each month. Once again though your bill will be gathering interest so be careful not to be too nonchalant about making the repayments. You will receive a monthly bill as with the store card indicating how much you owe and you will be given the option of paying a minimum payment or the full amount. 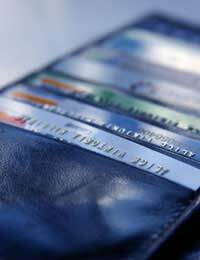 The interest rate on credit cards is often lower that store cards. The main difference between credit cards and store cards is you can use credit cards in a variety of stores and businesses whereas you can only use the store card at a particular chain of stores. This often means people get more than one store card in order to be able to shop in a variety of stores.With credit cards you can also withdraw cash from cash machines whereas with store cads you are never able to access the cash for any other purpose than to shop at that store. Both credit cards and store cards come with their risks so it is better to avoid paying on credit if at all possible. However that is not to say neither have their uses. If you know you can pay back the credit and can manage your card well that you should have no problem taking out a store card or credit card although it likely that the credit card has a better rate and can be used in a variety of places so this is probably the better option. Make sure you look around for the best rates before taking on anything. Try not to use the credit card or store card unless necessary and with credit cards especially don’t fall foul to the mistake of using your credit card to pay for every day items.